Salpointe thespians Jackie Barra ‘20 and Luke Williams ‘22 have been nominated for the National High School Musical Theatre awards for the Southern Arizona Region. They have been invited to compete at what is now called the Monte Awards. The male and female winners will receive a one week, all expense paid trip to New York where they will compete in the Jimmies. What an honor for these talented Lancers! "We are so proud of Luke and Jackie for their hard work," said Ericka Quintero of Salpointe's Theatre department. "This is a huge accomplishment for them and a reflection of our terrific Drama program." Jackie and Luke shined in Salpointe’s presentation of Footloose last semester. They are excited to perform in this spring’s presentations of Bang Bang You’re Dead, Faith County and Murder Music Mayhem. Salpointe’s drama program is consistently recognized for student and faculty creativity, hard work and performance success. 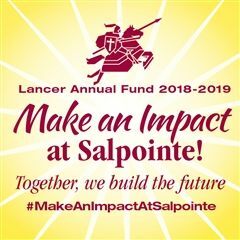 This year, Salpointe’s Thespian Troupe 5370 performed at the Southern Arizona Festival of Theatre and 14 Lancers received 21 “Superior” scores. These outstanding actors and actresses will be traveling to the University of Nebraska this summer to compete at the International Thespian Festival.